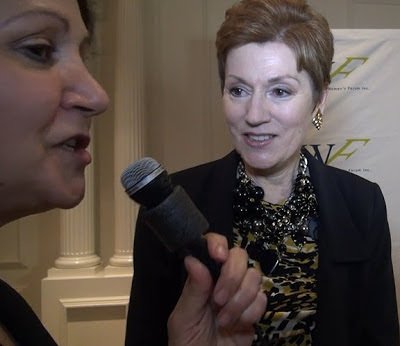 Below is the latest video, 'One to One with Gloria' and Beverly Beaudoin during red carpet at The 3rd Annual Elly Awards at The Plaza Hotel, New York City on June 25, 2013. I was very impressed by executive leader, Beverly Beaudoin, President of the Education Fund of the Women’s Forum of New York. The fund gives grants to women over 35 who have gotten their life back on track, to enable them to attend college. Beaudoin, an honoree of the New York Women’s Agenda in 2011, is currently the Chief Strategy Officer of BoomBox Inc. one of the fastest growing award winning digital agencies in the country. She leads a team of digital strategy experts who work closely with their top Fortune 500 company clients to find new insights for building a thematically relevant brand story. She is a big picture person who loves analyzing a client's needs and connecting the dots that lead to big insights and strategies. She delivers on those strategies, having launched breakthrough products during her career. Beverly holds a M.S. in Communications from Columbia University and a B.A. from Boston College. ► Beverly Beaudoin, Chief Strategy Officer of Boombox, Inc.